Home » » 17-year-old Depressed Girl Jumped to Her Death from Very High Building. 17-year-old Depressed Girl Jumped to Her Death from Very High Building. A 17-year-old Thai has killed herself, sending family and friends into mourning, Pattaya News reports. 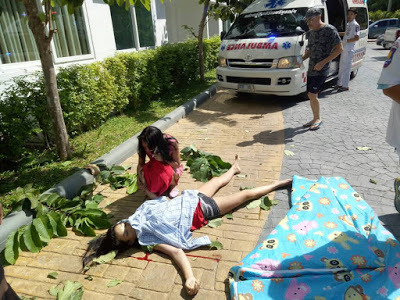 The young girl who was suffering from depression jumped from her condominium in Pattaya, hitting the ground and dying instantly on Thursday, September 21. Pattaya police and emergency services dispatched out to the Amazon Residence in Pattaya, after receiving reports that a young girl had jumped from her condo. Arriving at the scene, they found the dead body of the the young girl lying in the car park of the condominium block. The block is 8 stories high and police believe that she made her way to the top floor before jumping to her death. Blood was still pouring from varies places on the body and the medical team quickly wrapped up the body and took it away to a local hospital for a full postmortem. The girl had been suffering from depression for some time already and although she was on medication, her condition had seemed to have been getting worse, according to friends and family members that she had been staying with. Although realising that the young girl’s condition had been getting gradually worse, they had seen nothing unusual to suggest that the victim would feel the need to end it all in such horrific circumstances. The victim was originally from Sa Kaew but had moved away from her home town in the hope that her condition would improve, but unfortunately, that was not the case. Her family have been notified.